Can Eating Chicken & Turkey Sandwiches Help Me Lose Weight? You already know that eating better is a crucial part of losing weight. But with so much conflicting information about calories, fat, carbs, fiber and protein, it can be downright confusing to figure out exactly what to eat to slim down. There is some truth to the idea that chicken and turkey sandwiches can play a role in weight loss, but before you set out on a poultry-only diet, make sure you understand the benefits and limitations of these foods. The weight-loss power of turkey and chicken lies in their protein contents. Protein is the most satiating nutrient, meaning you feel fuller and more satisfied when you eat it, according to "The American Journal of Clinical Nutritio". It also leaves your stomach slowly, so you can last longer between meals without feeling hungry. Finally, high-protein foods like poultry require more energy to digest and metabolize, so your body actually burns calories just by moving them through your system, reports "Women's Health" magazine. Chicken and turkey, especially the breast meat, are low in calories but very high in protein, making them perfect foods for people who want to lose weight without feeling hungry. Protein-packed turkey and chicken are great for weight loss, but if you're putting these lean meats inside a sandwich, you need to choose wisely. Refined breads, cheeses and creamy sandwich spreads like mayonnaise can add hundreds of calories to an otherwise healthy sandwich without adding much in the way of filling nutrients. On the other hand, using whole wheat bread and stacking your sandwich with veggies and low-calorie spreads like mustard or hummus keeps the calorie count under control while adding fiber, which is another low-calorie nutrient that helps you feel and stay full. Turkey and chicken sandwiches are great staples if you're trying to lose weight, but they're far from the only sources of low-calorie protein and fiber. Other lean protein foods include beans, seafood, tofu, low-fat and non-fat dairy products, eggs, pork tenderloin and lean cuts of beef. Fiber is found in hundreds of foods, particularly fruits and vegetables; whole grain breads, cereals and pasta; brown rice; barley; and beans and lentils. If you enjoy turkey and chicken sandwiches, go ahead and enjoy one every day. Just keep in mind that you can have too much of a good thing. Eating sandwiches at every meal in an attempt to lose weight will quickly backfire when you get so tired of them that you're reaching for the nearest junk food just for a change of pace. Besides that, limiting yourself to just one type of food deprives your body of essential nutrients, no matter how healthy that food may be. 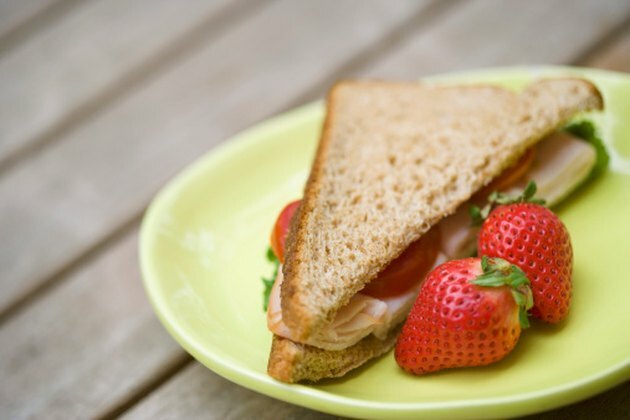 So make a chicken or turkey sandwich a lunchtime staple, but make sure to eat a wide variety of low-calorie and nutrient-rich foods so you can lose weight, nourish your body and enjoy your meals.